Judging by the first quarter performance, small stocks are besting big stocks by a wide margin (4% versus flattish) and that trend is likely to continue well into the second quarter. Even some of the investing world’s biggest names are gobbling up stocks in the small cap and microcap world. In fact, a major “icon” in this arena just acquired over 50% of a $12M microcap. I do not know his intentions, but judging by his track record, I suspect he believes it has the ability to increase in value by rise 2-5x from current levels. With that in mind, perhaps it is not a bad idea to ride his coattails. Click the link below to see which microcap is now in serious play. 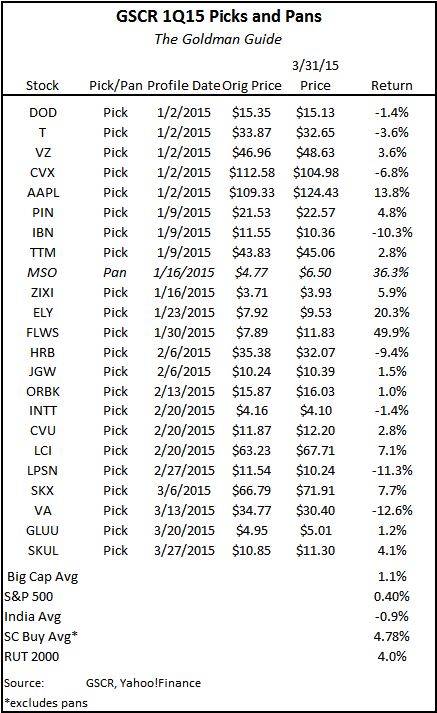 Plus, see how our picks fared in Q1 and which ones we like for Q2. Friday’s job report likely would have spooked some investors considering it was so poor. On the flip side, a bad jobs report only prolongs the time until interest rates rise, which is good for stocks. Maybe I am being naïve but I think that this jobs report will serve as a near term low point (employment number-wise, not market-wise) and there is a possibility of a very modest bounce in April, since weather likely played a factor. Still, it may have to be driven by small businesses. Regardless, in our universe, what is bad for big caps tends to be good for small caps. A higher dollar hurts exports and makes small stocks, which typically do not export products, attractive. Another shoe that we expect could drop and hurt big caps are mid-April earnings results, whereas small cap stocks could have fewer disappointments or lower guidance events, thus buoying the segment. Market watchers have no doubt noticed that for the first time in a few quarters small stocks trounced the performance of their big cap brethren. While the DJIA components were down slightly in the first quarter of 2015, the S&P 500 Index, aided by stocks like Apple (NASDAQ—AAPL) rose .4%. The NASDAQ Composite, buoyed to a degree by health care, biotech and tech notched a 3.2% gain while the Russell 2000 jumped 4%, besting them all. I confess I have never been much of a fan of corporate raider and rabble-rouser Carl Icahn, but you would be hard pressed to ignore his results. Although he usually plays in the big cap, big brand name arena in which to exert his influence, he occasionally steps outside this comfort zone and into the small cap arena. With Voltari Corp. (NASDAQ—VLTC—$2.63), a stock with a mere $12m market cap, Icahn had done just that. Voltari Corporation, together with its subsidiaries, provides relevance-driven merchandising, digital marketing, and advertising solutions, primarily over smartphones and other mobile devices to brands, marketers, and advertising agencies. It also offers predictive analytics services. Icahn was involved with its parent company (before a spin-off) some years ago but that did not pan out. In the interim, he quietly acquired a roughly one-third ownership in the stock. However, in recent days, it has gone haywire as it has been announced that Icahn now owns over 52% of the stock. Look, I don’t profess to know what his endgame is with VLTC. But, I expect that whatever it is, he will see to markedly increase its value by 2-5 times. Moreover, with effective control of the company, I do not see him “getting out” for a trade. Who could/would buy it? Clearly, he has some grandiose business development in mind that will organically or inorganically increase the value of the stock. Looking for a flier with an extraordinarily successful guy at the helm (ownership-wise)? You could probably do worse than VLTC. It is probably worth a trade to $5.